I frequently use the water displacement method to seal ziploc freezer bags when I sous vide. I can get maybe 99% of the air out, but technically the bag is not under vacuum. 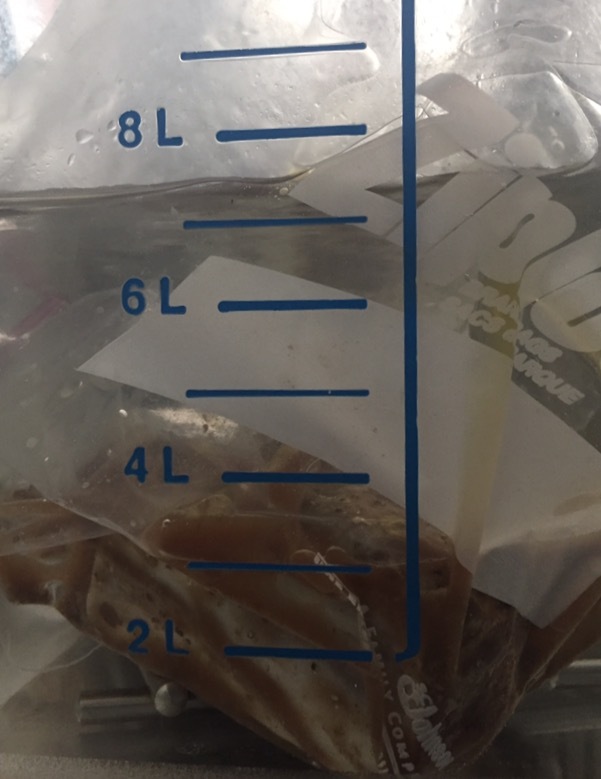 If I clip the top of the bag to the side of my container, any air pockets that emerge collects at the top, and the meat is entirely in contact with the bag and immersion bath. Alternatively, if I seal the bag with a marinade, there are no pockets of air between the meat and the immersion bath. I can't imagine that the temperature transfer can be any more effective when vacuum sealed. So why does a site like SeriousEats still suggest that a vacuum sealer is needed for best results with longer cooking times? In the context of food storage in plastic bags, SeriousEats claims, "excess air causes oxidation that can develop into off flavors or promote spoilage." But I never sous vide for the freezer, it gets served when done. There was a comment that asked if food contamination might occur for cooking times longer than 48 hours, but it was never answered. What is the science behind this statement? How much residual air is "too much"? If the bag remains submerged, does not leak, and the food in full contact with the water bath, is that enough to duplicate the benefits of a true vacuum seal? Also, what is the scientific impact of trapping small amounts of residual air in a pocket above the water bath? This assumes that there is still a very strong thermal coupling between the water bath and sous vide item. In the photo below, you can see at least a 2inch gap between the air pockets above water level and the actual short ribs. From a heat transfer perspective, I can't imagine that a vacuum sealed bag can perform significantly better—certainly not relative to a 48hr cook time. Is there a possibility of bacterial contamination? The main problem I've found is that air pockets can cause the bag to float, causing uneven heating. If your bag sinks, or if you have something to make it sink, it should be fine. The dedicated vacuum sealer makes better seams than the ZipLoc Freezer bag edges. For long duration cooking, this is a big advantage. I have to double-bag when I am doing an extended cook at a higher temp. And working out air pockets is twice as painful with two bags and hot water! Not the answer you're looking for? Browse other questions tagged sous-vide or ask your own question. Sous Vide effectiveness of trapping residual air above water bath? Is a vacuum strictly necessary for sous-vide cooking? How can I improve sealing of bags for sous vide? Why are my sous vide salmon fillets coming out raw in the center? Should vacuum sealed food be exposed to air when thawing?